Radiesse is an FDA-approved calcium hydroxylapatite (CaHA) filler that we use for treating moderate to severe facial lines & wrinkles. 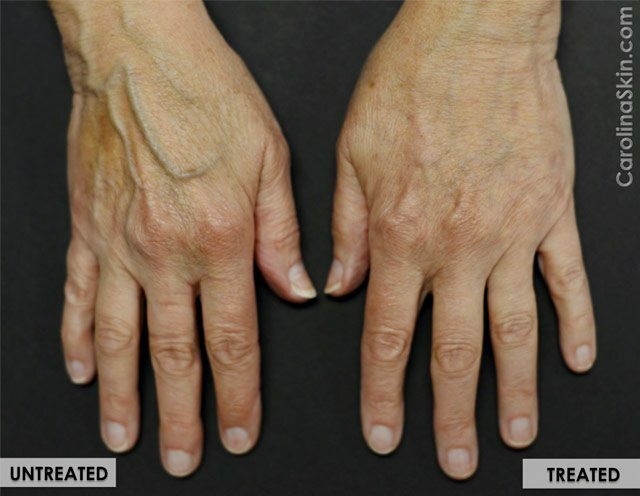 Radiesse is also effective for replenishing volume loss in the top of aging hands. All cosmetic injectable treatments that we offer at DLVSC are performed by one of our board-certified providers, ensuring the highest level of safety and efficacy for our patients. Am I a good candidate for Radiesse? If you are interested in Radiesse treatment, you should make an appointment to have a cosmetic consultation. Our board-certified physicians are expert injectors and will be able to tailor a treatment plan especially for you! What is Radiesse treatment like? After we’ve gone over the treatment plan with you, we’ll start the injection process. On average, this treatment should take about 10 to 15 minutes. Radiesse comes with lidocaine already mixed into it, which helps make the treatment more comfortable for you. After the optimal volume correction is reached, the physician may manually massage the treated areas in order to make slight adjustments to the placement of the filler. Afterwards, we’ll review your aftercare instructions and send you home with an ice pack to help with initial swelling. What are the side effects of Radiesse? Any downtime? Radiesse generally has very few side effects, especially when administered by an expert injector. You may have some redness, swelling and/or bruising at the injection sites, which is to be expected with almost all dermal fillers. These side effects are all temporary and shouldn’t interfere with your normal routine at all. If you do develop bruises, we offer a complementary vascular laser treatment that will help them clear up much faster. There is no downtime expected with Radiesse. In order to limit your risk for bruising & swelling, we recommend that our patients avoid alcohol consumption and limit intense exercise or heavy lifting in the first 24 hours after treatment. In addition, don’t massage the treated areas unless you’re instructed otherwise. When will I see results from Radiesse? How long will they last? You’ll see results from treatment immediately! Radiesse is FDA-approved to last for 9 to 12 months. However, everyone’s response to filler is different, so it’s difficult to predict how long your Radiesse will last. Due to this variation, we advise that it could last anywhere from 6 to 15 months. Mouths are very mobile (talking, smiling, chewing, etc.) which can have an impact how long filler will last in this area. For some, fillers break down more quickly around the mouth than they would in areas with less movement, such as the temples. Although not always the case, you may notice a slight reduction in volume at around 3 months post-treatment. This is due to the way that our bodies break down this type of filler. The decrease in volume may be discouraging, however, the filler is actually transitioning into a sort of “scaffolding” in the skin where your body deposits its own new collagen. You should continue to see the volume gradually fading over the course of about one year.